I'm happy to be participating in the fourth week of Project QUILTING. (You can find me at #110 if you'd like to vote for my project.) This week's theme is Brighter the Better. We were asked to crank up the saturation in our projects. Let me just say, my stash was made for this challenge. 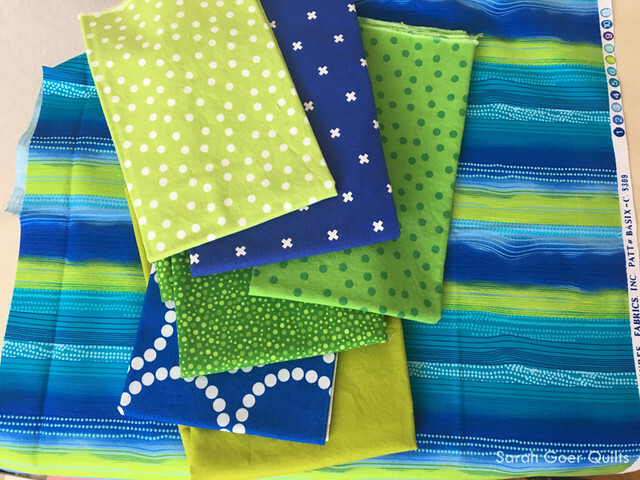 My initial pull of bright, vibrant fabrics resulted in a variety of bold stripes. 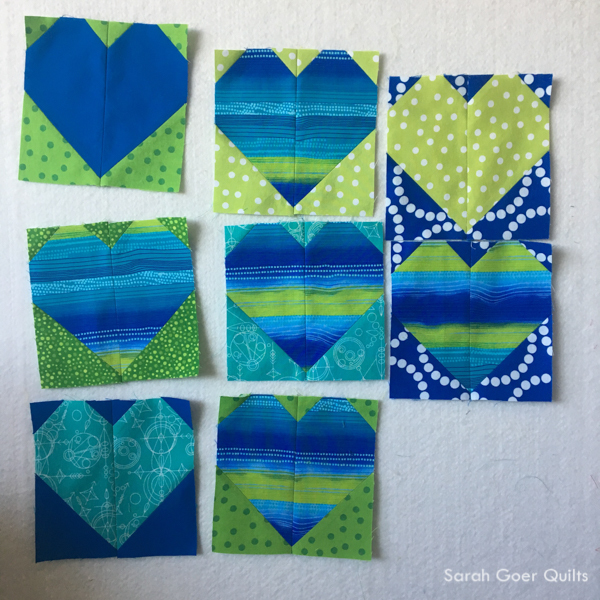 I was inspired on the morning of Valentine's Day by the heart blocks being posted on Instagram. 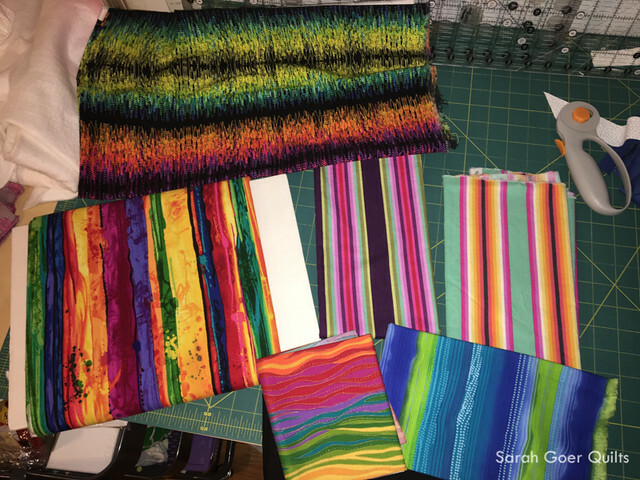 I decided to go with fully saturated hearts for my project and chose one of my stripes to inspire the color palette. 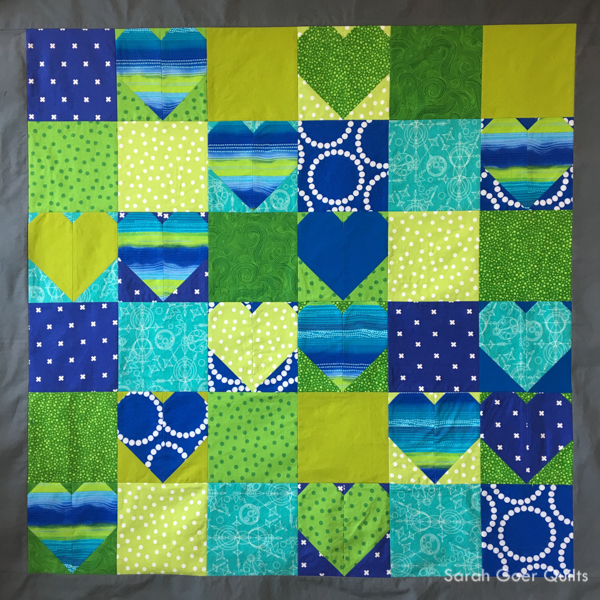 I settled on the 5" finished size of the Simple Heart Block by Cluck Cluck Sew. I had a limited amount of the striped fabric and this size seemed to maximize the number of blocks I could create – seven. I cut a variety of background fabrics for these striped hearts. Then I went on to make additional pairings for more heart blocks. 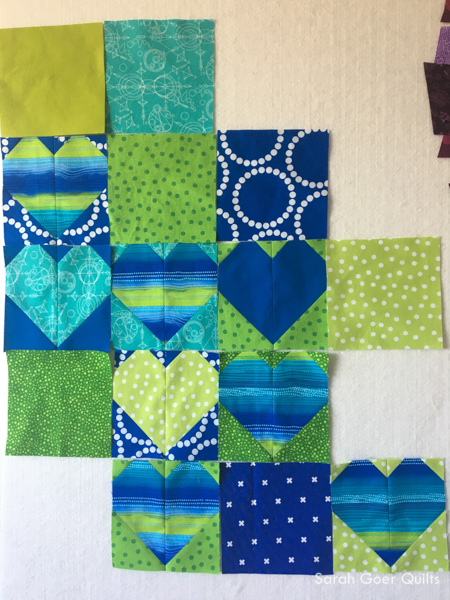 I decided early on I would include some square blocks interspersed with the heart blocks. 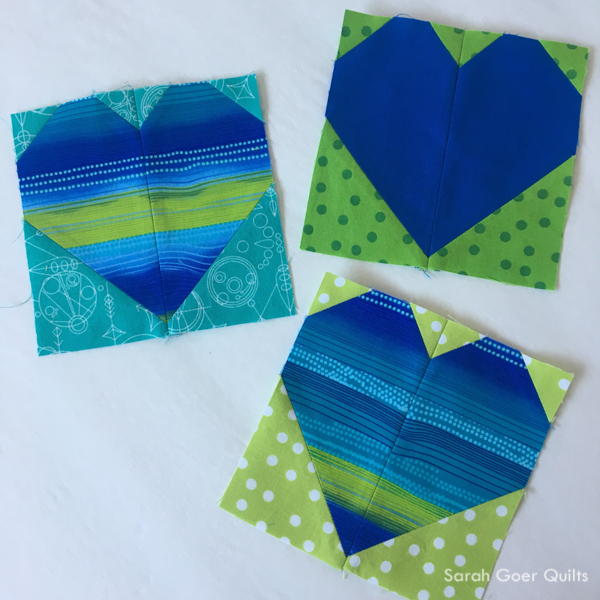 In the end, I stopped sewing heart blocks when I got tired of making them. ;-) Inadvertently, I sewed 14 heart blocks on February 14th. The next morning I filled in the remaining spots with squares and began work on a final layout. I could have spent days rearranging blocks on the design wall. I didn't want like fabrics to touch on an edge (corners were okay) and I wanted hearts (and more specifically striped hearts) in each row and column, and I wanted some balance. I added the grey border so I wouldn't lose my points when I added my binding. I machine bind and it's not a perfect 1/4". I should probably do some work to figure out how to plan that my machine binding land in the right place by adding a little space around the quilt top when I trim it after quilting. I thought I would walking food quilt crosshatch spaced 1 1/2", but when I started my quilting after 10pm last night I decided on 2 1/4". Two hours of quilting later, I finished that step at 12:40am. After I slept, my 4 year old daughter supervised my work attach the binding and then helped with my photo shoot. ;-) I had planned to bind it in grey to match the border, but decided in the vein of "Brighter the Better" I would use one of my blue fabrics. I had the perfect amount of this print! The backing fabric (also from my stash) was purchased a while ago to back a project that I recently gave away (in WIP status). 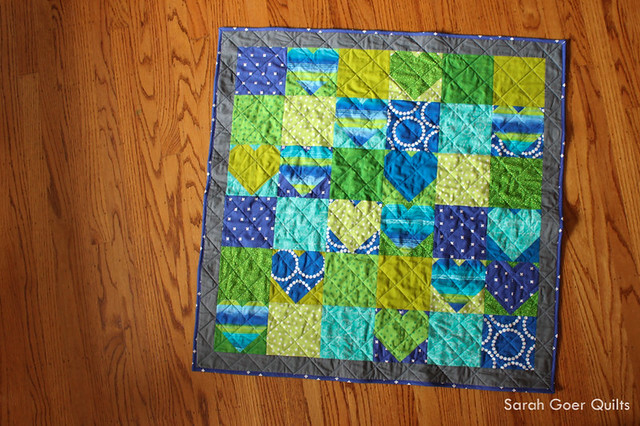 I thought it was the perfect combination for this quilt. My quilt finished at 34" x 34" which I think means it's the perfect size to go to a NICU. 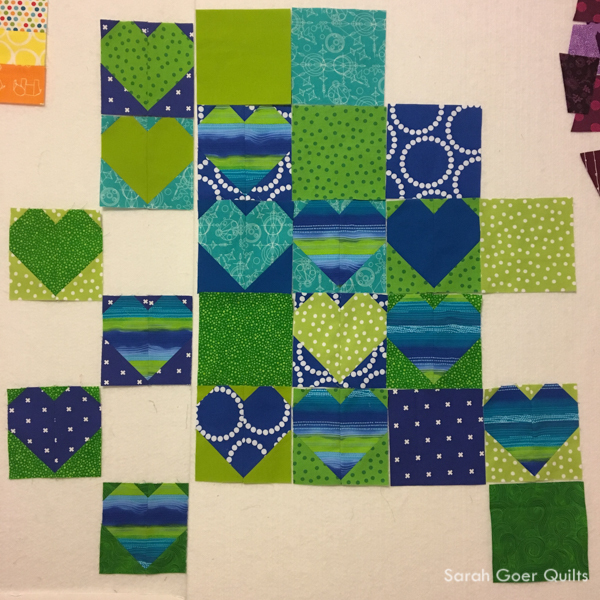 I'm linking up to Persimmon Dreams for the Project QUILTING Brighter the Better Challenge and to TGIFF at A Quarter Inch from the Edge. Posted in Quilting. 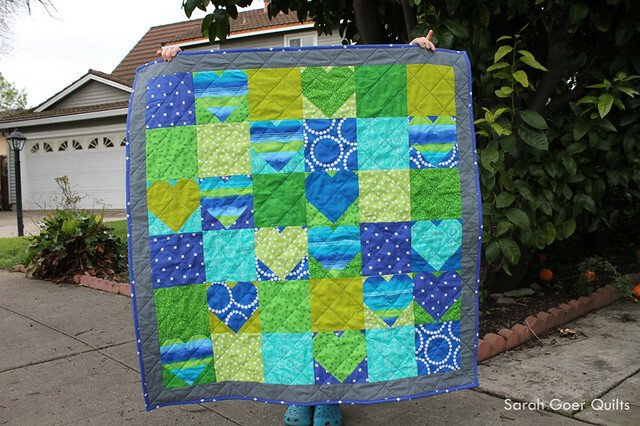 Tags: baby quilt, challenge quilt, finished quilt, Project QUILTING on February 19, 2017 by sarah. This is super bright and fun and congratulations for getting it done in time this morning! In case if helps, I like to trim about 3/8" from the edge of my points to keep my binding from "eating" them, but I would probably up that to 1/2" if I were going to machine bind. That's a good plan. I'll have to try it out with some small projects. Thanks for the feedback! 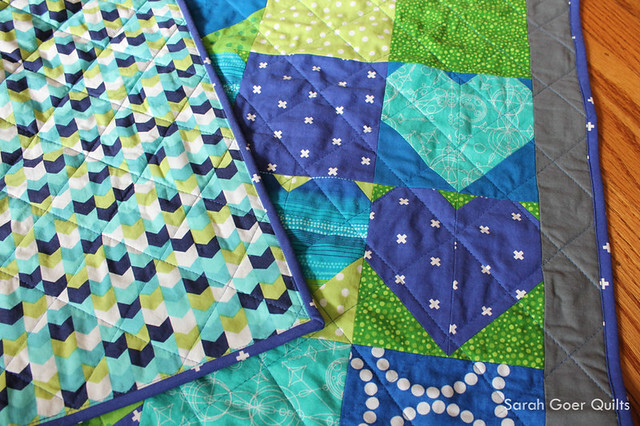 Love, love, love your blocks and color palette! And great selection of the blue print for your binding!! It's so funny... 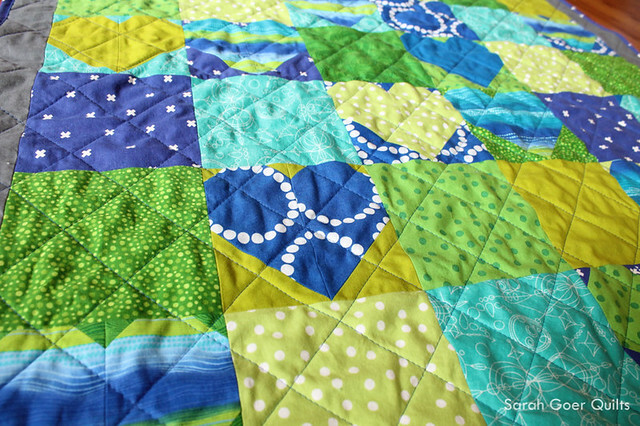 I've not really heard of Project Quilting before, but now I've read three posts in one week making reference to it! 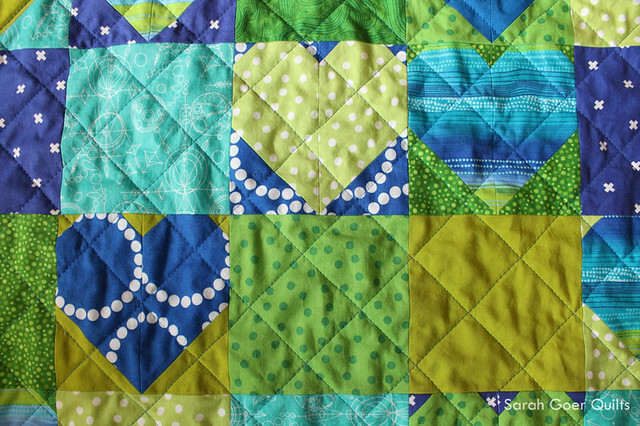 I really enjoy your fabric selection for this quilt (I have at least 4 of your chosen prints in my own stash!) Thanks for linking up with TGIFF @ A Quarter Inch from the Edge! There have been over 100 participants for each challenge this season. (Largest participation so far!) It's the first time I've participated, though I've been watching it for a couple years. Sounds like you have a pretty great stash! ;-) Thanks for visiting, Jenn! so sweet and beautiful! Thanks for joining in the PQ Fun! It's beautiful. This is a great colour scheme. I love this so much! I love the hearts scattered in and that color scheme is my fave!